I used L.A. Girl Army Green as a base for the thumb, then mixed with Essie Mink Muffs and Nubar Forest for the gradient. For the index finger, I used Essie Foot Loose as a base, with Color Club Ms. Socialite for the gradient. On the middle finger, I used Orly Snowcone as a base, then mixed with Orly Cosmic FX Lunar Eclipse for the gradient. The base on the ring finger is Eyeko Saucy Polish for Naughty Nails, with A Beautiful Life Poison for the gradient. Lastly, the pinky was Zoya Jancyn as a base, with CND Electric Orange for the gradient. For all the letters, I used Sally Hansen Professional Lavender Cloud, then topped it all off with 2 coats of Seche Vite top coat. Do you live the Suite life? Disclosure: Eyeko Saucy polish was sent to me for consideration by the manufacturer. yes, indeed, I do. Very much so. In fact I dont think ive closed my PS for over a month lol. 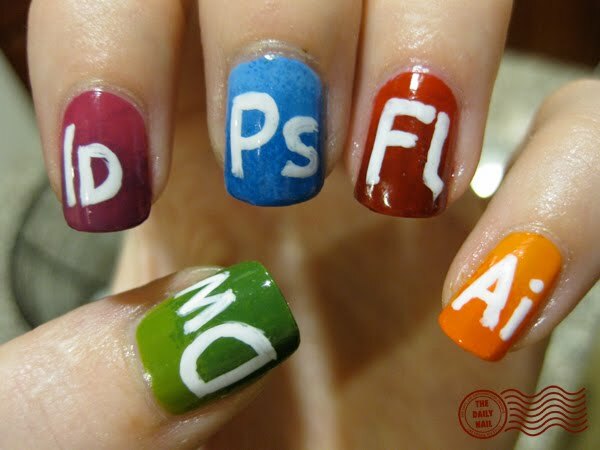 lol nice, I am also a graphic designer, so the Adobe icons are something I am very familiar with! I wanna smell you sooooo bad!!!! Hey! I'm brazilian and I really love what you do with your nails. I'm crazy about nail design and I'm practicing too. your tips are really great ! i really like what you doing with your nails.i dont speak i lot english as you can read.but a really enjoy your work,so every day i waitin for your post. So hope one day maybe you can do ''WIZARD OF OZ'' nails. cuz i love that movie and today is 71 anivesary. y por que no? suerte. Oh, i definitely live the suite life!! i LOVE this! if i was still in college i'd be rocking this design in my art classes!